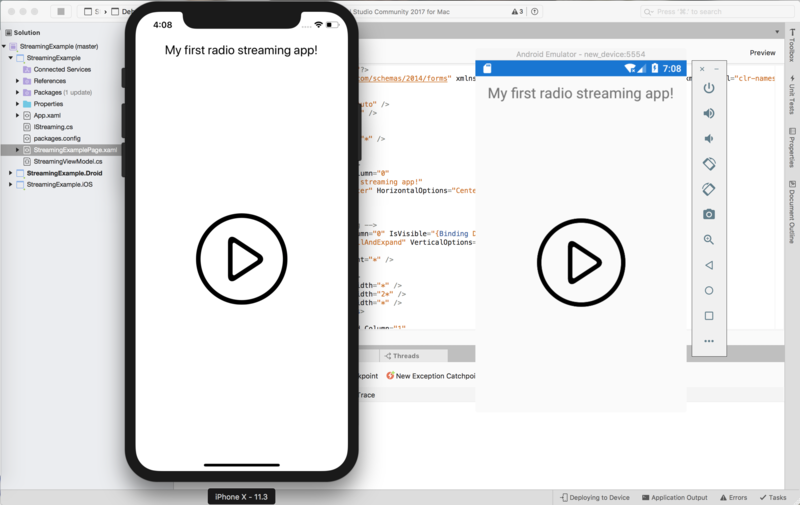 In this Xamarin tutorial we are going to create a simple radio streaming player app for iOS and Android. The radio will have 3 simple actions: Play, Stop and Pause. Intro: What are we going to learn and/or practice? Create a simple View with a ViewModel. Using images as buttons for Play, Pause and Stop. Use Data Binding to change icons when radio start/stops playing. You can go here if you just need the Dependency Injection stuff. The streaming links we want to reproduce. To test the links before using them, open them in the respective devices browsers, they must be two different links. Check the general workflow of my posts. Important: debug after each step!. It’s the most simple and best practice. Create a Xamarin.Forms blank app with Android and iOS projects. For the design of the MainPage we are going to use some images for play, pause and stop button. I downloaded them from FlatIcon music pack. Default main page is located in the Xamarin.Forms project and named YourSolutinonName.xaml. A Label is added by default. We must use a layout to add more elements. I am using Grid, because it’s easy to size. In iOS: drop them in Resources folder. In Android: drop them in Resources/drawable folder. Then, we are going to add 3 Image tags in the main page, usually named like the project. In the example I use two Grids to encapsulate the images. As I recently said, it’s easier for me to size things with Grid. Now we are going to add TapGestureRecognizer to our images. This, as it names says, provides tap gesture recognition and events. Finally, we must implement these callbacks addded to each image. For a while, we are just going to change IsVisible properties of the images. In the new iPhone X we have to keep some area safe. Our firend Xamarin provides us a method to do this. Let’s add it in the MainPage.xaml.cs. All the view logic will be implemented in our ViewModel. To create it, add a new class to somewhere in the project. For big projects I use a folder named ViewModels, but for this example let’s just drop it in the project main folder. I called it StremingViewModel. Now we are going to link our view to the new view model. I always creat ViewModel property to avoid casting in each call. But this is still useless… Jump to the next step! Glossary for Data Binding definition. We are going to use Data Binding with the IsPLaying property. Inherit view model from INotifyPropertyChanged. Bind properties in the view. Glossary for Dependency Injection definition. Create an interface in the project. I’ll drop it in the project folder and call it IStreaming. We are going to use this interface as a Dependency Injection. This means we are going to implement it separately in each plataform: iOS and Android. Note: you can’t run until you implement the injection. Now the most important and interesting part! Allow streaming domain in Info.plist. The Foundation framework provides a base layer of functionality for apps and frameworks, including data storage and persistence, text processing, date and time calculations, sorting and filtering, and networking. Xamarin has an implementation of this framework! Obviously, change your.domain.com for your domain. Finally, we want to listen to our radio while the app is in background. We are going to add this to Info.oplist. Now you can run iOS project. It is quite simmilar to iOS, but we are going to use native Android.Media. We have a radio player in Android and iOS! Add some images to the UI for play, pause and stop actions. Implement TapGestureRecognizer to hide and show the images when tapped. Add a ViewModel to manage logic. Set the ViewModel as the BindingContext of the view. Add interface to manage streaming natively. Implement interface in each device. Call the interface implementations from view model as a Dependency Injection using DependencyService.Get.